The repair work by Sally Strachey Historic Conservation Ltd., which was begun on 12th June 2017, proceeded by and large according to plan, though the completion date (originally mid-October) had to be put back several times (eventually to the end of January). The delays were largely due to the scaffolding taking longer than expected to erect, the quarry having difficulties in providing suitably cut rag stone, and periods of bad weather. The quality of the work by this specialist company, however, has been excellent and impressed our architect, Paul Sharrock. They carried out the work within budget, and following a massive clean-up by a working party of volunteers, the church was reopened for worship (whilst external work continued) at the beginning of December in time for a Christmas Concert and events such as the Snodland C of E Primary School Christmas Service, Christingle and Midnight Communion. In January 2018, whilst re-pointing was being carried out on a section of wall where once a fireplace and chimney had been, a surprise discovery was made of a 15th century manuscript (part of a pre-Reformation prayer book). The Friends have paid for it to be properly displayed and it is now in the safe-keeping of Rochester Cathedral, where it will be on occasional display in the crypt. A Service of Thanksgiving and Rededication was held in the church on 11 February 2018 and attended by a large number of local people as well as by the architect, builders, stonemasons and representatives from different groups and individuals who had supported the project. The preacher was Ven. Julie Conalty, the Archdeacon of Tonbridge. The church was festooned with hessian strips decorated by a wide range organisations within Snodland including the WI, football club, chess club, bowls club, local schools and uniformed organisations. The church has been open to visitors on Saturday afternoons throughout the summer. There was a concert in the new year, a talk and various exhibitions. The ‘Journey of Life’ educational programme attracted 142 Year 6 children from 4 local Primary Schools, and adults attended the Quiet Afternoon in August. We hope to build on this in 2019. A second phase of repairs will hopefully resolve most of the outstanding problems highlighted in the original Quinquennial Report. These will involve lower level work to stonework around some of the windows, the west porch, the east end, and dealing with the damp (particularly in the north wall of the nave) caused by poor drainage. A final Evaluation Report was submitted to HLF in September 2018. The urgent repair work at All Saints Snodland is nearing completion. Internal scaffolding around the chancel arch has begun to be removed. A cleaning party, armed with brooms, dust pans, j-cloths, buckets, polish, hoovers etc. will gather in the church on Saturday 2nd December at 10.00am to clean the building as best they can in preparation for its reopening. In addition to the above, the Invicta Primary School, Snodland C of E Primary School and the WI will also be holding carol services in the church. A formal rededication service will be held in the New Year. The HLF grant for the current urgent repairs was £222,600 with a total expenditure of over £300,000 being spent. A public meeting will be held in the New Year so that everyone interested can learn about what has been achieved and what still remains to be done. The Activity Plan which has accompanied our repair project is progressing well. Amongst its many constituent parts, there is a new adult guide book already published and available at Home & Hobby in Malling Road, Christ Church and the museum in Waghorn Road, and there is an almost completed guide book for younger people. The beautiful illustrations in the book have been prepared by the artist, John Cook, who grew up in Snodland and is kindly doing the work at a much reduced price. There is an almost finished map of local walks incorporating All Saints Church, which is being developed in conjunction with the Kent Wildlife Trust; and there are two presentation stands which will hopefully be constructed (subject to DAC approval) for the poor box and old medieval door at the back of the church. News updates on the welcomer/guide scheme, the educational project and planned concerts and exhibitions in the church will be made in due course. 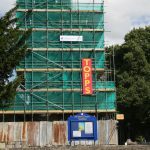 Urgent repairs to All Saints Church in Snodland began in earnest at the beginning of June with the erection of internal and external scaffolding around the chancel arch and tower. Almost 3,000 metal tubes are estimated by the workers involved to have been required for this purpose. The stonework above the chancel arch is in a worse condition than originally thought and more stone will need to be ordered to repair and rebuild that section of the wall. However, it is still anticipated that all the high level, urgent repair work will be completed on time and within budget. The official finish date is 1st December, though we hope that it may be finished sooner . Throughout the afternoon refreshments will be available; the ‘Friends of All Saints’ will have a stall, and a representative from the contractors will be present to answer questions. Inevitably places on the ‘Hard Hat’ tours are limited for health and safety reasons and will be allocated on a first-come first-served basis. Participants will need to be 12 years old or over, wearing appropriate footwear and clothing, and able to climb scaffolding ladders and negotiate the openings at each floor level. The contractors will always have the final say as to who they are happy to have on the scaffolding and reserve the right to refuse entry. A new guide book of All Saints Church has recently been published and is on sale for £2.00 from the Snodland Museum, Home & Hobby, or the ‘Friends’. It was announced today that All Saints Church in Snodland has received a confirmed grant of £222,600 from the Heritage Lottery Fund (HLF). Made possible by money raised by National Lottery players, the grant will enable the All Saints Urgent Repair Project to carry out repairs to the stonework of the tower and chancel arch and to the floor of the ringing chamber. The church was closed to members of the public late last year. As previously reported the church is an important historical building and a ‘local treasure’. It is strategically located at the point at which the Pilgrims Way crosses the River Medway. A church has stood on the site for over a thousand years and is mentioned in the Domesday Book (1066). It was placed on the English Heritage ‘at risk’ register in 2014. When it is re-opened All Saints will be made much more available to the wider community and the building will be better utilised as a venue for talks, concerts and small exhibitions. There will be ‘hard hat’ tours while work is being carried out guide books will be printed. A team of guides and welcomers will be recruited and trained for when the church is open in the summer and a ‘Journey of Life’ educational programme for schools will be developed, making use of the recently installed Snodland Stones prayer walk and the church’s key position on the Pilgrims Way. With the support of the Kent Wildlife Trust (KWT) measures will also be taken to promote wildlife in the churchyard and people’s appreciation of it. In conjunction with this the KWT is assisting with the production of circular walk leaflets in the vicinity of All Saints. The Rector was very grateful for the generous support of Snodland residents and well-wishers, as well as several grant-making bodies which has enabled the necessary match funding of over £35,000 to be raised. The head teacher of Snodland Church of England Primary School, Holley Hunt, said: “We are greatly looking forward to the re-opening of All Saints Church. This church is very special to us; we hold all of our key services here and the children enjoy visiting the church as part of their RE learning. As many of you will know, the church of All Saints Snodland which is currently on the English Heritage ‘at risk’ register was awarded a development grant of £25,100 by the Heritage Lottery Fund (HLF) in December 2015 to work up plans for a major project to carry out urgent repairs. Thanks to the generosity and support of the local community, the project planning phase has been going extremely well and the church will hopefully be able to proceed with the project in 2017. All Saints will now be closed temporarily until essential repairs have been completed, and all services will take place at Christ Church, Malling Road, until further notice. Over the Christmas period this will include the Christingle, the Service of Nine Lessons and Carols and the Midnight Communion. The times of all services will remain unaffected. “The deadline for completing the Development Stage of the HLF urgent repair project is fast approaching. As part of this project a series of investigations took place at the beginning of August (looking at the condition of the stonework, timbers etc). A report with detailed proposals was then prepared by our architect and sent to the Diocesan Advisory Committee and Heritage Lottery Fund (HLF) for their approval. Historic England was then also forwarded a copy for their comment and agreement to go ahead. The investigations have revealed that the stonework above the chancel arch is in a worse condition than was originally thought and the poor use of cement to repair the tower in times past is also more prevalent than expected. It seems, however, that our architect largely anticipated the changes to the planned work which Historic England have now requested. 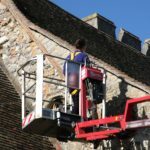 Tenders are currently being obtained from four firms all of which specialise in the repair of ancient buildings. Subject to these being within budget and approval being given by our own church council, an application to the Heritage Lottery Fund for the main Delivery Stage grant will be made. If this grant is forthcoming, we will hopefully be able to go ahead with the urgent repairs in 2017 shortly after Easter. Friends and supporters have been working extremely hard to fund-raise for the project, and we have received generous donations from several individuals, organisations and grant-making bodies. It has been very encouraging. The match funding of £35,000 which we need by the beginning of December in order to apply for the main HLF grant for 2017 is now in place, though of course, as was intimated at the Public Meeting earlier this year, once these extremely urgent repairs have been completed, additional funds will be required for a second phase. The Project Team has been busy preparing the Activity Plan to make All Saints more effective as a cultural and spiritual resource for the wider community. This will be sent to the HLF together with the match funding and the tenders for the proposed repair work. More details of the Activity Plan will be announced in the New Year, but suffice it to say that there will be a wide range of ways in which the Friends of All Saints and other supporters will be able to be involved at a practical as well as financial level. We will be looking, for example, for more people to join our team of welcomers and guides, to learn bell ringing, to assist with cleaning and maintenance jobs, to help organise concerts, talks and exhibitions of artwork, and to help with the educational programme on pilgrimage and ‘the journey of life’ which we are developing. On Saturday, 12th November, at 7.30pm in the Community Centre ‘A Musical Evening with Candlelit Supper’ is being held in aid of the All Saints HLF project. The event will feature a concert and a two course cold buffet. The music will cater for a variety of tastes and will be provided among others by Alberta Atkinson (a former pop star and now gospel singer), Sally Ironmonger (a well-known Medway folk singer noted for her comic songs) and Snodland Choral Society. Tickets cost £10 per person and are available from Andrew Ashbee, Les Yates, Chris & Linda Howick and Home & Hobby. Please do join us if you are able to do so and encourage your friends to come along too. The more people we can encourage to become Friends, the better able we will be to put All Saints Church on a secure footing for the future. Les Yates, treasurer to the Friends of All Saints, is running a stall at the Snodland Christmas Lights market, where he will doubtless have a range of products on sale including the popular church calendars which Andrew Ashbee and Chris Howick produced. Thank you to everyone who has been supporting this project. As a certain supermarket has so rightly observed, ‘Every little helps’! Progress in the Development Stage of the Heritage Lottery Fund project to save All Saints Church in Snodland has been very encouraging. This ancient, Domesday Book ‘local treasure’, needs a total of around £35,000 match-funding by the beginning of December to secure the main HLF grant and to ensure that the Delivery Stage in 2017 goes ahead. Following the Public Meeting on 9th April numerous gifts and pledges have been made to the Church and Friends of All Saints and practical offers of help have also been received. Snodland Church of England Primary School for example generously decided to donate all the money raised from its summer fayre. Applications have been made to various grant-making bodies, and various fundraising events organised. A highlight in the Friends’ recent fundraising activities was their Open Day on 11th June which featured not only tours of the church and cream teas, but an art exhibition in celebration of the Queen’s 90th birthday, organised by Sue Brooks with the assistance of Keith Holdstock. People of all ages came to view it; it was very impressive. Corgis, coaches, crowns and castles all featured, as well as some excellent portraits of the Queen. There were some truly excellent contributions from pupils of St Katherine’s Primary School and Snodland C of E Primary, as well as from St Katherine’s pre-school and an adult art group. The Rector expresses the hope that the church will host many more cultural community events of this kind in the future.